Two weeks in, and a lot of players do not look good. In fact, really the only first round picks that have truly met expectations are Antonio Brown and Melvin Gordon. Maybe you could include Jay Ajayi and Mike Evans in that discussion. Instead, Chris Thompson, who was barely drafted in a lot of leagues, has more rushing yards on one rush than Jordan Howard, second round ADP, has all season. Also, Trevor Siemian is currently the QB1. Yeah, the guy who almost got benched this offseason. On a better note, plenty of early round picks have good opportunities to produce this week. Let's take a look. Love 'Em - Cam Newton vs. NO: So far this year, the Saints have given up 793 passing yards and two top 3 finishes. One of those quarterbacks was Sam Bradford. Newton is a better quarterback than Bradford. In the past 4 games against New Orleans, Newton has averaged approximately 30 fantasy points per game. As if the New Orleans secondary wasn't bad enough already, they're missing CB1, CB2, and CB3 for tomorrow. The Panthers are feeling good after a 2-0 start and I expect the offense to get back on track with a high-scoring victory over New Orleans this week. Leave 'Em - Dak Prescott @ ARI: So far this season, Dak Prescott has been exposed. Zeke hasn't necessarily been dominating so far, so opposing defenses aren't stacking the box like they were last year. Obviously the argument could be made that it's because they've played two elite defenses, but Arizona is right up there with the best of them. Prescott's numbers significantly drop whenever Dez Bryant's covered by an elite corner, and Patrick Peterson is expected to be all over him. I expect Dallas to try and get the run game going early, and if they do, it could become a blowout fast and Dak has no reason to throw. Love 'Em - C.J. Anderson @ BUF: When healthy, CJ Anderson is surprisingly a very good running back. He's eclipsed 200 total yards already this year and now gets a matchup with the Buffalo Bills, who let up the 4th most rushing yards and 2nd most rushing touchdowns. If Denver continues to play like they have been, they could find themselves with a comfortable lead at half which would mean plenty of work for Anderson. Anderson is this week's RB9 on fantasypros.com, and he's got a good chance to find the end zone tomorrow which would mean really good fantasy numbers. Leave 'Em - Terrance West vs. JAC: As Javorious Allen becomes more and more involved in the offense, the value of bruising back Terrance West is decreasing in a hurry. He was out-touched by Allen 19 to 10 last week, and he only had 45 total yards last week and was saved by a touchdown. He's extremely touchdown-dependent right now, and Jacksonville's defensive line is no joke. Allen will inevitably have a bigger role, and I'm staying away from West starting now. 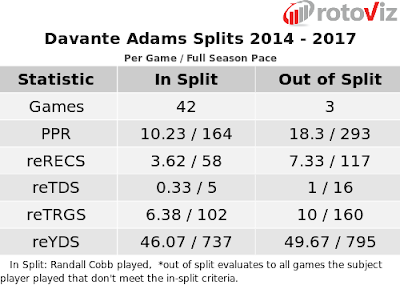 Love 'Em - Davante Adams vs. CIN: Davante Adams looks like his 2016 self so far this year, currently sitting at WR12 on the year including a tough Seattle matchup. This week, he faces a weak Cincinnati team overall who just let up 7/73 to Deandre Hopkins, and Adams always has a really good chance to find the end zone. Jordy Nelson and Randall Cobb are both injured, and reports are saying Cobb might not even play this week. This would give Adams a lot more targets and Rodgers should definitely target him a lot. Adams is coming off a huge week 2 and I like his chances to repeat this week. Leave 'Em - Mike Evans @ MIN: Wait, what? Well, no. Hold that thought. I'm not saying to sit Mike Evans. It's more of a "don't be furious when he doesn't meet his projections" deal. Evans will be up against Xavier Rhodes, who clamped Antonio Brown for 3/27 last week and held Michael Thomas to 5/45. Evans will be matched up against him in week 3 and Minnesota knows that the only way of winning will be through a defensive affair. If Antonio Brown couldn't get anything going against Rhodes, don't expect Evans to be able to do much. Love 'Em - Zach Ertz @ NYG: For the second time this season, Zach Ertz is my start of the week. He is matched up against a tough New York Giants secondary, but they've given up 5+ receptions and a touchdown both weeks this season. Plus, Ertz is the most talented tight end they've faced so far. If the tight end spot isn't working, Ertz can go in the slot, which is why I love him. He's TE2 this week on fantasypros.com for good reason. Leave 'Em - Jimmy Graham @ TEN: Jimmy Graham has 4 catches for 9 yards this year. Ouch. He's injured and Seattle's passing game as a whole is dysfunctional. The offensive line is really bad and guys like Doug Baldwin and Jimmy Graham are losing value as a result. He now faces Tennessee, who haven't really faced a team that uses the tight end but they aren't too bad of a defense so it's no cakewalk for Graham. Personally, I'd leave Graham on the bench and possibly stream a guy like Evan Engram until I see Graham produce.